The publisher’s blurb states plainly that Kamila Shamsie’s Home Fire is ‘a contemporary reimagining of Sophocles’ Antigone’. That should have been a clue, but I didn’t read the blurb until after I’d finished the novel. Once the connection with Antigone penetrated my brain, Home Fire exploded in a whole new way and I went straight back to the beginning to read it again. 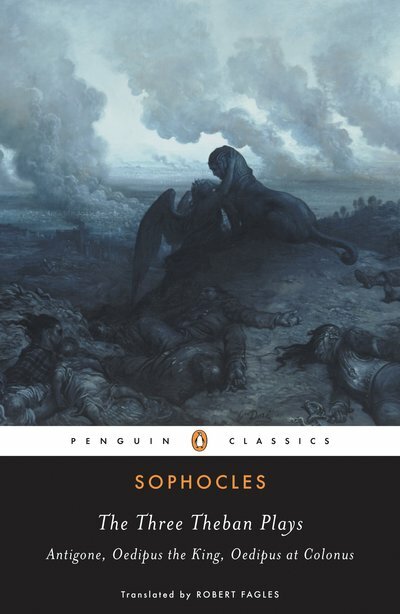 I first read Sophocles’ Antigone a few years back while tutoring an English literature student. Together we grappled with the history of Greece in the fifth century B.C., its embryonic democratic structures, its demands on citizens’ loyalty to the state, and its great festival of Dionysus (god of wine, ritual madness and religious ecstasy). Plays, many of them tragedies like Antigone, were performed during the festival, and playwrights competed for the acclaim of audiences and judges. Antigone rails against the injustice of Creon’s edict and plans to bury Polyneices regardless: ‘even if I die in the act, that death will be a glory’. Ismene counsels compliance. To her way of thinking Antigone is ‘wild’ and ‘irrational’ and ‘in love with impossibility’. The play’s conflict is set: Creon’s espousal that whoever places friend or family above the good of country ‘is nothing’ because ‘our country is our safety’ versus Antigone’s ‘give me glory’ rallying cry. Karamat’s son Eamonn (Haemon), ‘a man carrying all the wounds that his father was almost certainly too thick-skinned to feel as anything other than pinpricks’. These five players are set against the backdrop of a British government running an assimilation and conformity policy on migrants in general and Muslims in particular; a government showing no mercy to those it deems to have ‘acted against the vital interest of the UK’; a government that says: ‘we will not let those who turn against the soil of Britain in their lifetime sully that very soil in death.’ Aneeka versus Karamat, Antigone versus Creon. It’s the conflict between family and country, between justice and law, all over again. In Sophocles’ Antigone, Polyneices is already dead when the play begins and Haemon’s role, as Creon’s son and Antigone’s fiancé, is minor. But Shamsie gives these men equal billing as main characters. 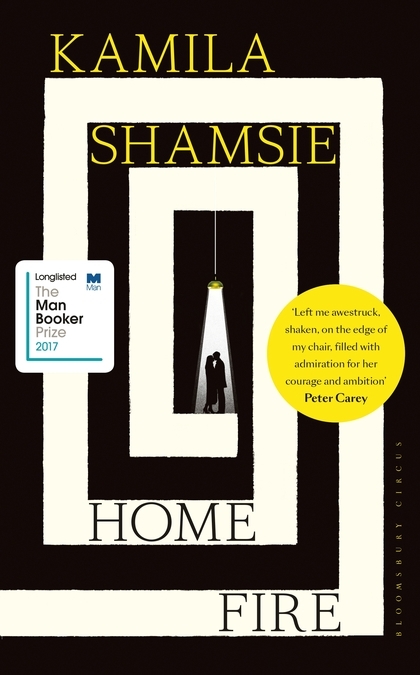 While I was fascinated with the overall congruence between Shamsie’s reimagining and Sophocles’ original, I was especially struck by the vitality Shamsie breathes into these two less-explored young men. Karamat Lone describes Aneeka (for reasons that become clear when you read the novel) as ‘the nexus of Al-Qaeda and Islamic State’, but I think of her as the nexus between Parvaiz and Eamonn. Soon after Aneeka meets Eamonn, she places her hand on his wrist and smiles. She then takes his other hand and places it on her heart. ‘We match’, she says. It’s a moment that echoes Aneeka’s relationship with her brother: ‘As children the twins would lie in the garden, fingers on each other’s pulses … waiting for those moments when their hearts were synchronised’. Initially, it may seem that the strongest connection between the two men is Aneeka’s beating heart. True, both are the only sons of migrant families who left northern Pakistan to settle in London, but the families’ paths soon diverge – Parvaiz’s father leaves his family to fight with Al Qaeda and dies en route to Guantánamo, Eamonn’s father navigates party politics and religious prejudice to fight through the ranks of the Westminster system. Their fathers’ choices place Parvaiz and Eamonn on seemingly different trajectories. Parvaiz lives on Preston Road, a few kicks from Wembley Stadium; Eamonn makes his home in an expensive apartment in Notting Hill, a stone’s throw from his family home in Holland Park (both residences a short distance from Kensington Palace). Parvaiz works at his local greengrocer’s stacking shelves; Eamonn, according to his father, works at ‘beating his own high score in computer games’. Apart from Aneeka, what could these two men possibly have in common? From my reading, quite a lot. Both Parvaiz and Eamonn have a secret. In each case, the signals of secrecy are mis-read by friends and family. Early in their rapidly evolving relationship, Aneeka insists that Eamonn tell no one. Parvaiz’s secret is of a different order. As he increasingly discovers his dead father’s Al Qaeda activities and resultant torture, and is groomed for his own place within ISIS, Parvaiz burns with ‘the incandescence of a beautiful secret in his heart’, ‘a hidden corner of his life’ that his sisters know nothing of. Parvaiz and Eamonn become obsessive and inward-looking. As the Messenger and Leader in Sophocles’ Antigone observe, ‘too much silence has its dangers’. With limited perception, Parvaiz and Eamonn lionise their fathers. ‘We want to be like them, we want to be better than them’, says Eamonn. Parvaiz subscribes to the view that his father, Adil Pasha, saw the world ‘for what it is. And having seen it, he understood that a man has larger responsibilities than the ones his wife and mother chain him to’. The words apply equally to Eamonn’s father, Karamat Lone. It takes a shock for both sons to shed their blinkers and see their fathers’ choices in a truer light. Jolted by military training outside Raqqa, Parvaiz realises that he is ‘his father’s son in his abandonment of a family who had always deserved better than him’. For Eamonn, it’s his father’s reaction to the revelation of Eamonn’s connection with Aneeka and her family that provides the reality-check. Karamat scolds his son with the words: ‘You stupid stupid boy. My stupid boy.’ And suddenly, ‘where there’d been a father, now there was a Home Secretary’. Neither Parvaiz nor Eamonn has the father he thought he had. For more on Antigone and Greek tragedy, see playwright and theatre researcher Christine Lambrianidis’ 2015 essay in The Conversation, ‘Antigone Now: Greek Tragedy Is the Debate We Have to Have’. The ABC’s now defunct Book Club discussed Home Fire in the program’s final episode. You can listen to the panel’s reactions and reflections here. To understand a little of Kamila Shamsie’s own relationship with the uncertainties of dual citizenship and of making a home in a new country, see her article ‘On Applying for British citizenship: “I never felt safe”’. While Shamsie doesn’t have a website, she does have an active presence on Twitter and also a Facebook page. Further biographical background is available via the British Council website. Shakko. 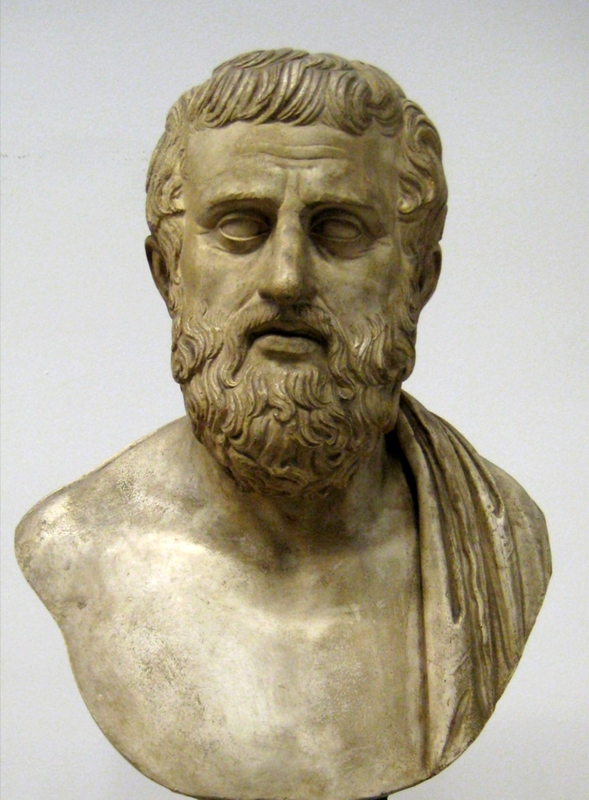 Sophocles. Cast of a bust in the Pushkin Museum. Reproduced under the Creative Commons Attribution-Share Alike 3.0 Unported license. Andrew Lih. 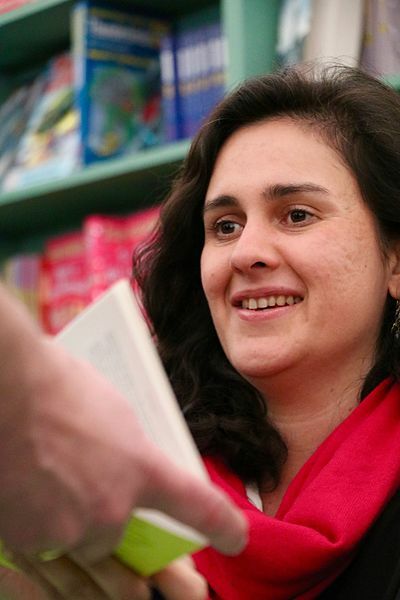 Hay Festival 2016 – Kamila Shamsie. Reproduced under the Creative Commons Attribution-Share Alike 3.0 Unported license.